It’s a fast-growing trend and no secret that more and more seniors are choosing to remain living at home instead of transitioning into an assisted living facility or nursing home. Those seniors who do make this decision often do so as an effort to hold on to their independence and dignity. When remodeling a bathroom for the elderly, it is important to make changes that allow them to freely move throughout the bathroom without the risk of slips and falls. In order to achieve this goal, you’ll want to look at a variety of options from walk-in bathtubs, to showers, grab bars, lighting and more. According to The Center for Disease Control and Prevention, about 235,000 people seek medical help due to bathroom-related injuries each year. The most important thing to bear in mind when remodeling a bathroom for the elderly is their safety. Here are some ideas to consider when remodeling a bathroom specially designed for an aging senior. 1. 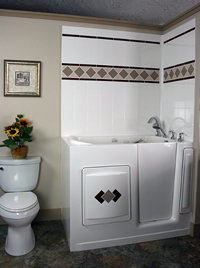 Bathtub/shower – Walk-in tubs are one of the best bathtubs for seniors, given the many safety features they include. Most walk-in tubs include safety bars/railings, seating, and non-slip floors. All walk-in bathtubs are lower to the ground, which makes entering and exiting the tub a breeze that requires little effort.Make sure to browse different tub options to get the best deal and the most features. 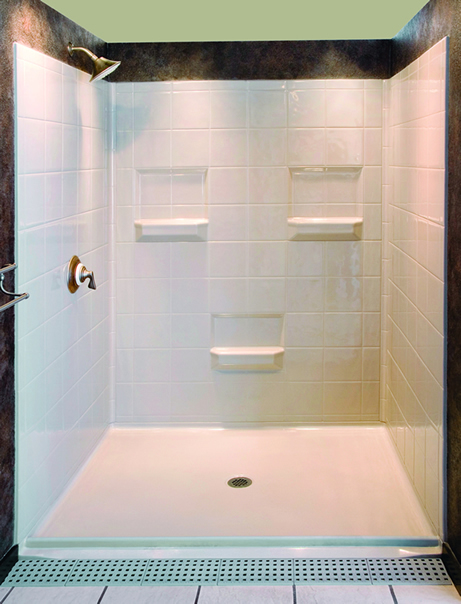 Some walk-in tubs may not include other features such as a fixed showerhead, handheld showerhead with adjustable settings, or whirlpool jets (for relaxation). When shopping for a walk-in tub or shower, be sure to consider these features before purchasing the tub. 2. Toilet – Install a senior-friendly toilet, (usually called chair-height toilets) which will give the senior freedom to raise and lower their body weight with minimal effort. A special lift chair is also available to assist in the lifting and lowering of an individual. 3. Non-slip flooring – If you’re on a budget, carpeted bath rugs or bath mats with a non-skid feature work wonderfully for preventing slips. Bath mats are less expensive than replacing the flooring which makes them an obvious choice for pennies on the dollar. 4. Height adjustments – Making small adjustments such as lowering the sink or toilet can make a substantial difference in a senior’s comfort level within their bathroom. Just remember, if the senior uses a wheelchair, you’ll want to make sure to include enough knee clearance so they can comfortably get to and from the sink. 5. Providing extra safety – Install grab bars throughout the bathroom where they are needed most. Place a handrail next to the toilet, bathtub, or shower. Basically, install grab bars wherever a senior would need additional leverage to pull themselves up. Another interesting feature that could be of great use to a senior is a telephone line or alert system in the bathroom, just in case. Having an available resource to contact people for help, when in need, could prevent serious injuries in the bathroom. 6. Light fixtures – Seniors typically have impaired vision, so replacing the light fixtures will eliminate shadows and unnecessary prevent bumps and bruises. One other great idea for brightening a bathroom is a vanity mirror. Now that you have some ideas to get started in the bathroom, consider what other options you might need throughout the home such as widened doorways or wheelchair ramps. Although most accidents do occur in the bathroom, you’ll want to make home accessibility modifications throughout the rest of the home as well. 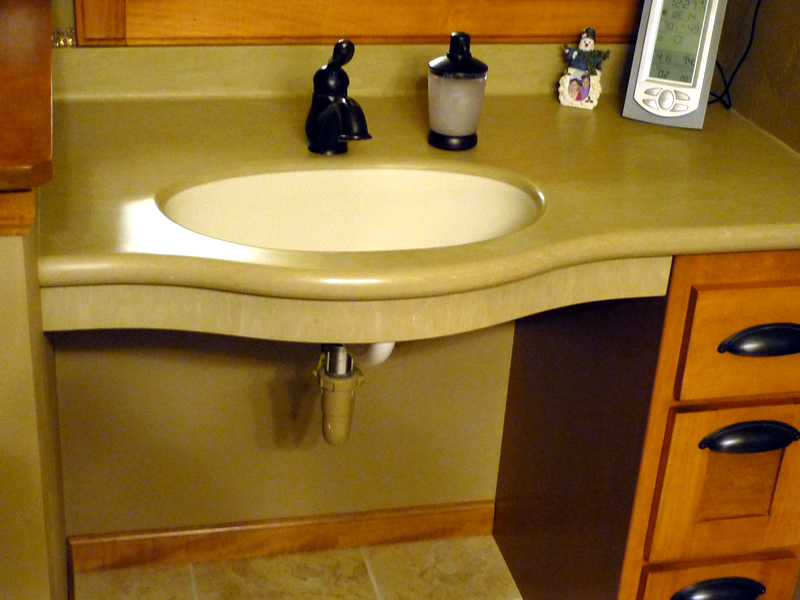 Accessible Bath Solutions can assist you with all of your bathroom remodeling or home accessibility needs in Appleton, Green Bay, Oshkosh WI and beyond. Just give us a call at 920-636-5450 for a free consultation when you’re ready to discuss your options. We can assist you with anything to make your home more handicap-ready or senior-friendly – no matter how big or small. How long does it take once you are in the tub for it to fill up while you are naked? Oh hey, I am thinking of installing a walk in bathroom for my mother in-law who is spending time with us. So far, it looks like I would need to do a bathroom renovation on my kid's bathroom since the one that my wife and I share is too small. Now, what type of tool would be needed for this type of renovation? I have an aunt and an uncle that needs to get there bathroom remodeled safer. They are pretty old and they need a safer bathroom, especially a non-slip floor. I am looking at one else they could use to stay safe. The tip that stuck out to me was when it talked about using non-slip flooring, which would seem important if elderly people are going to be using the bathroom. The other thing was when it talked about making height adjustments to the different fixtures. It might be a good thing for someone to do some research to determine the best remodeling strategy for your particular needs. Thank you for the list of ways I can remodel my bathroom. My wife just got her first wheelchair and I would like to make sure that she is comfortable in the bathroom. Having a walk in bath would really nice for that my wife. We just had to get my grandparent's bathroom remodeled. One of the things that was 1st on the list was what is 1st on this list. We installed a walk-in bathtub. This was necessary for us to do because my grandpa has had some strokes and now he's not mobile. My grandma is getting to the point where we need to do some bathroom remodeling like this. That way she will be able to use the things in her bathroom without risking the chances of getting hurt. It is going to be a lot better for her and will give us all peace of mind. No matter what it will take to get this done, I will make sure that I get it done for her. Awesome, thanks for the advice on making a bathroom safer for seniors. My parents are coming to live in my basement. We are wanting to remodel their bathroom to make it safer for them. We will have a plumber come and do the things you mentioned. I like the idea of non-slip flooring in a bathroom. I tend to slip a lot in mine, and it has become a problem. Maybe I'll look into getting it remodeled in the near future. Tip number three seemed like it could be relevant not only with senior citizens, but with everyone else. I don't think people would want to slip and fall in the bathroom. The other part that caught my attention was when you said that changing the height of things can help as well. I can see how that could be true, especially with older people. The thing that stood out to me most was the non-slip flooring. These are all such impressive ideas to keep your seniors safe in the bathroom. Most accidents happen in the restrooms too. We're thinking about getting a senior bathtub to easily walk into. What would you recommend? My grandpa will be moving in with us very soon. Because of this, we will have to make some adjustments with our home, especially with our bathroom. He just doesn't move around as well as he used to. Therefore, we must make the bathroom more grandpa friendly. Thanks for the share. My grand parents lives with us and I always wanted to make them things easier while bathing. 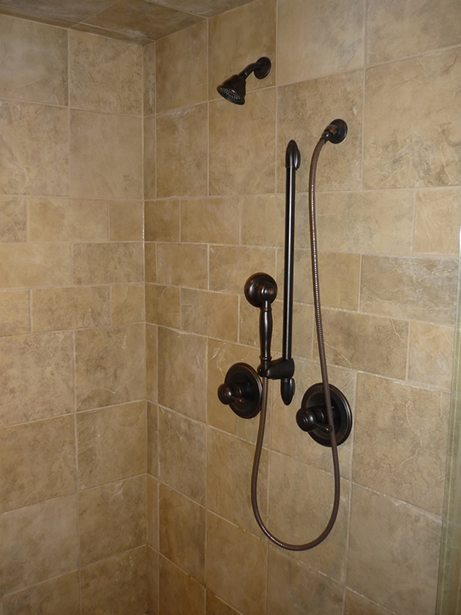 Your walk in shower ideas is best. I am really gonna try it. Great! impressive and useful tips. I am sure if someone use it will get the good result. Kids and Aged people have to face maximum problems with simple washroom even sometime simple washroom or bathtub become harmful. So just safe the life of your elder people and use above tips to be safe. When there are senior members of your family living alone, I think it is vital that you take measures to provide them with features, not only in the bathroom, but throughout the home, in order to prevent a harmful fall. The reality is elderly persons tend to stumble, lose their balance and fall. Look at what happened to Barbara Walters at the Presidential Inauguration. I'm sure most people know an elderly person who has fallen. I think this is a great idea, I have a parent that is getting down in her health and I think this would be a great thing to do for her. I'm going to start looking into doing this and see how much of a loan or savings I am going to have to get before I can do it. If they already have a disability will their insurance pick up any of the bill? I agree with Maude I am ready to modify my home now. People want to keep their dignity as they age and they are able to do that if they can continue to stay in their homes and take care of themselves. Even when they get to the point where they shouldn't be alone if they are still able to bathe by themselves because of the accessibility it will mean a lot. 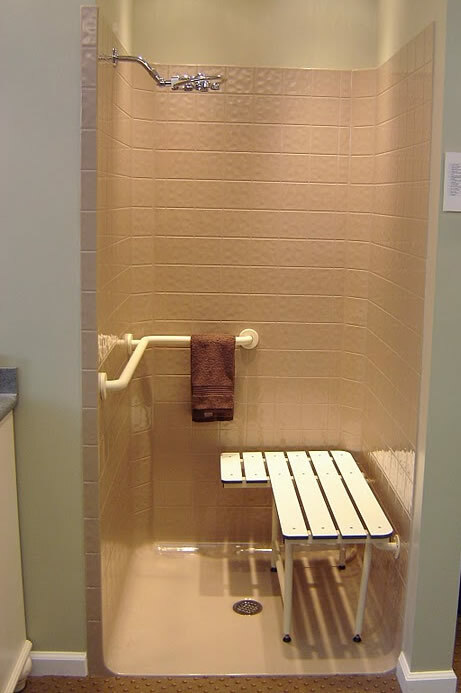 The walk-in tubs are quite expensive and a necessity if you are disabled or not able to use the normal bath tubs. These tubs are obviously much more expensive in comparison with the normal bath tubs. It's looks are luxurious! These tubs are easily available all over the web, and even maybe somewhere close to you. You will need them for someone and you will want to be able to get them. When people think about a bathroom outfitted for elderly, I guess there are some typical and general things that come to mind. But I think the most important part of remodeling a handicapped bathroom for the elderly is meeting the needs of the person who will be using it. Many elderly people use a wheelchair or walker to move about - and I'm sure there are other specific needs. I do know this: certain design aspects of homes turn into obstacles when limited mobility and decreased range of motion become an issue. The bath represents an area of particular concern for older people. I am sensitive to this fact because I have parents who are seniors and becoming elderly quicker than I would have ever thought. Bathroom accessibility and safety concerns must be addressed in homes with senior family members. I don't care for the fact that seniors are doing this I want to do it to my home now and I'm only forty three years old. I love those walk in tubs and showers and things like that. The more I can do now with my home the less I have to do when I get to that age. This was a great article and I look forward to reading your next remodel post. Great article, with a growing population of aging baby boomers walk in bathtubs can be a huge help in reducing injuries as well as adding independent living solutions to a huge demographic.